Discover how all levels Artificial Intelligence (AI) can be present in the most unimaginable scenarios of ordinary lives. 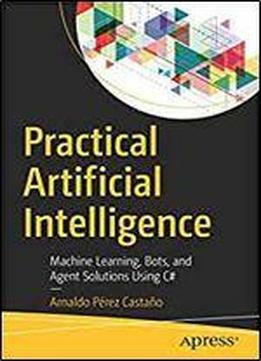 This book explores subjects such as neural networks, agents, multi agent systems, supervised learning, and unsupervised learning. These and other topics will be addressed with real world examples, so you can learn fundamental concepts with AI solutions and apply them to your own projects. People tend to talk about AI as something mystical and unrelated to their ordinary life. Practical Artificial Intelligence provides simple explanations and hands on instructions. Rather than focusing on theory and overly scientific language, this book will enable practitioners of all levels to not only learn about AI but implement its practical uses. What You’ll Learn Understand agents and multi agents and how they are incorporated Relate machine learning to real-world problems and see what it means to you Apply supervised and unsupervised learning techniques and methods in the real world Implement reinforcement learning, game programming, simulation, and neural networks Who This Book Is For Computer science students, professionals, and hobbyists interested in AI and its applications.